www.wever-ducre.com - Innovative and creative contemporary architectural lighting with ultramodern technologies. Ideal for both high quality domestic and those interesting areas in commercial applications. www.planlicht.com - Beautiful contemporary decorative low voltage and profile lighting. www.targetti.com - Italian flair combined with technological design. Light of Florence range offers excellent solutions for Church lighting. www.acdclighting.co.uk - Leading designers and manufacturers of specialist cold cathode systems, the preferred solution for the illumination of coffered ceilings, recesses, features and building perimeters. www.acdclighting.co.uk - The best products based around the most advanced LED technology, designed to create lighting effects never previously conceivable. 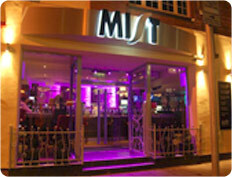 www.crescent.co.uk - LED spots, downlights, pavers, track systems, and CL linear systems as used on “The Light” project. 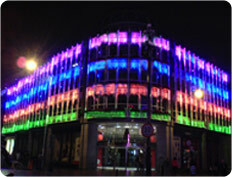 www.instyleled.com - Cost effective colour changing LED systems. www.collingwoodlighting.com - A simple range of groundlights, downlights, wall lights, bollards, strip lighting, fibre optic LED, and colour changing. www.matrixfx.co.uk - Innovative LED display and marketing screen. www.crescent.co.uk - World leaders in commercial fibre optic lighting, from the remarkable EFO system, to simple kits for domestic use. www.luxonic.co.uk - Manufacturer of high quality luminaries for Offices, Retail, Education, Healthcare, Recreation, and Protected areas. 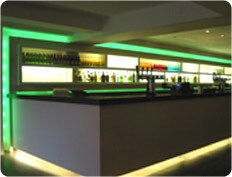 www.hilclare.com - A range of high quality luminaries for industry and commerce at a most economical cost. Ideal for design and build projects or value engineering solutions. A useful addition to our own “Contract” catalogue. www.ligmanlighting.com - A mammoth range of cost effective Architectural exterior products for designers and consultants. www.we-ef.com - Internationally recognised for their reliability, longevity, sound engineering, ease of installation and maintenance, and outstanding quality design. An obvious choice for Local Authority and prestigious projects. www.aresill.it - Truly Italian recessed in-ground uplighters, poles, beamlights, and wall lights. www.wmeyer.de - Miniature Superlight projectors for exciting lighting of building facades. www.kingfisherlighting.com - Columns, post tops, bollards, and floodlights for both design and build and specifier projects. www.lutron.com - Lighting controls and scene setting Grafik Eye panels.